Reverend Mother Mary Gabriel Long, Foundress of the Religious Community, Sister Servants of the Eternal Word, Birmingham, died on Sunday, July 23, 2017, at the age of 89. She will be dearly missed by her religious family and by all who knew her, for she was given a rare gift from God of inspiring people by her gifts of wisdom, intelligence, humor, and her great love of God. Mother Mary Gabriel was born Florence Marie Long on September 18, 1927, in Jackson, TN, to James Oliver and Nell "Nellie" Mae (Legg) Long. After high school, she joined the Dominican Sisters of St. Cecilia in Nashville, TN, and served as teacher and principal in 13 schools, including St. Rose Academy, Birmingham, AL (while she was principal there, St. Rose was the first private school to integrate in Birmingham); St. Cecilia Academy, Nashville, TN; St. Henry's School, Nashville, TN (Principal); Overbrook Grade School, Nashville, TN (8th Grade); and Mt. de Sales High School for Girls, Baltimore, MD (first Dominican Principal). While she was at St. Rose during the turbulent sixties, Mother Mary Gabriel was elected as co-chairman of the Formation Committee in preparation for the Chapter of Affairs, to which she was a delegate. During this time she was elected Vicaress General of the Congregation and served for six years. In 1986, she was invited by Mother Mary Angelica, P.C.P.A., to work with her on a project in Pennsylvania for single-parent families. 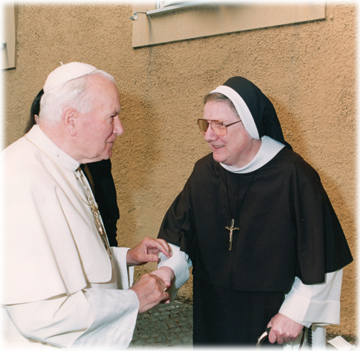 In 1987, Mother Mary Gabriel founded the Sister Servants of the Eternal Word, Birmingham. As she wrote, "St. Francis and St. Dominic, examples of poverty and learning as well as their heroic obedience to the Pope and to the Magisterium of the Church, have been chosen as the patrons of the Sister Servants. The unity of their hearts in Jesus Christ and their loving devotion to his Immaculate Mother typify the unity, love and zeal that gave impetus to and sealed their friendship. They inspire us how to teach the faith by the holy witness of their lives. We must be convinced that personal holiness is necessary in order to be an effective teacher of the Catholic Faith. It is not possible to teach the Catholic Faith without love, because charity is the greatest of God's commandments." Mother Mary Gabriel established Casa Maria Retreat House, which offers retreats and catechesis in the Catholic faith within the context of beautiful liturgies and Eucharistic devotion. Retreatants come from all over the United States to take part in these retreats. Mother Mary Gabriel was also deeply devoted to the message of Our Lady of Fatima, zealously promoted Her "Peace Plan" for the world, and encouraged the First Saturday Devotions. Mother Mary Gabriel is survived by her brothers and sisters: Anna Mae Coleman from Springfield, MO; Charles Reid Long from Kennesaw, GA; Martha Nell Bryant from Jackson, TN; Mother Assumpta Long, OP, from Ann Arbor, MI; and James Owen Long from Portland, OR; as well as numerous nephews and nieces and their families. See more of Mother Mary Gabriel's life with the Sister Servants in our Fall Newsletter.